Tony Romo can look like the next coming of Roger Staubach, but at times he can also have meltdowns that cost the Dallas Cowboys games. Last night, he had another one of his meltdowns as the Dallas Cowboys lost to the New York Jets by a score of 27-24. It looked like the Cowboys and Romo were going to start the season out right, but Romo fumbled and threw an interception in the final seconds to seal the Cowboys fate. Throughout his career Tony Romo has made it a habit of costing his team games. Last night, his teammates came to his defense, but how much longer can they do that when he is costing them games. 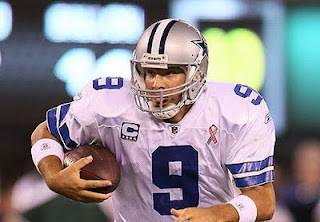 It would be okay if Romo had led the Cowboys to a Super Bowl, but he has not. Everyone knows in the league that Romo buckles under pressure and against good teams it always seems to happen. There is going to come a time when Jerry Jones is going to have to rethink his decision about Romo being the guy to lead the Cowboys. If losses keep piling up like this changes may need to be made.